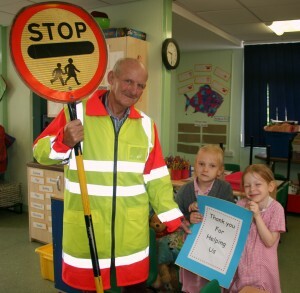 Students at St Thomas of Canterbury Catholic School waved goodbye to retiring Bill Evans, school crossing patrol officer or, more affectionately known as their lollypop man for the last 22 years. On his last day, Bill, 87 years old, answered questions from an assembly of four year old children. Important questions were raised by the safety conscious class including: “Why do you wear such bright colours?” and “Do you get angry at mums and dads in cars that don’t stop when you say so?”. After the event Bill spoke about his most memorable day. He recalled an eight year old boy chasing him before school. Thurrock Council’s Corporate Director of Environment and Place, Steve Cox said: “Bill is a well-loved and respected member of the school and local community. He is also Thurrock Council’s oldest employee. He added: “We wish him the best of luck for his retirement.